New Delhi: Three fighter jets supposedly leaving a trail of saffron, white and green hues across the blue sky can mean only one thing for Indian viewers — the tricolour. Or so suggests a viral fake post on social media. The video was originally shared by a page called Global Hindus Saturday and has received over 4,500 views. However, the flag is actually Italian and the location is the Italian Parliament. While the colours green and white do make an appearance in the video, the third colour is red — the three colours of the Italian national flag. 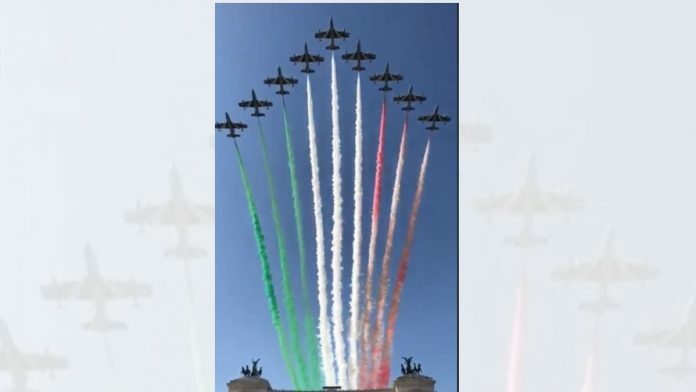 The video is from a demonstration by the Italian Air Force on its Republic Day, 2 June, in 2018. The celebration of Indian Independence Day in Trafalgar Square first made headlines last year. The event was planned to counter a pro-Khalistan rally in London on 12 August 2018. The Ministry of External Affairs had even issued a statement condemning the pro-Khalistan rally. As a result, two celebrations were held at Trafalgar Square last year. The first one was by the group Sikhs for Justice (SFJ), which organised a rally to raise awareness for a non-binding referendum for “Free Punjab”.